The title “Mother of God” is not found as such in the writings of the New Testament. The first known mention is that of Saint Hippolytus of Rome (d. 235). Later, Nestorius, Patriarch of Constantinople (428), will dispute the attribution of this title to Mary because of his views on Christology. For him, the Son of God is one thing, the son of Mary another, in the sense that he sees in Christ two Persons: one Divine (the Logos), the other human (Jesus). Consequently for Nestorius, Mary cannot be called “theotokos” (Mother of God), at least in the real sense demanded by the hypostatic union (the union of two natures, the human and the Divine, in the one Person of the Word). The Council of Ephesus (431) defends this unicity of person in Christ and condemns Nestorius and his followers. It approves, by acclamation, the second letter of Saint Cyril to Nestorius and through this approval officially confirms the attribution to Mary of the title Mother of God. The normative decision taken at Ephesus will be explicitly promulgated as dogma in 451 by the Council of Chalcedon. Thus, the title of Mother of God derives from Catholic teaching on the Incarnation of the Word. Mary conceives and brings forth, in His human nature, One Who is God from all eternity. Jesus is not God by the fact that He is conceived or born of Mary (this would not be a Mystery but an absurdity because it would make Mary mother of the Divine nature). Mary is Mother of God because from her own flesh she gives to the Word a human nature like hers. And just as in ordinary human generation, the truth of the parents’ generative action is not the human nature produced but the person subsisting in this nature, so in the case of Mary: her maternal action reaches to the Person of the Word, Who by this very fact is truly her Son. Mary is “theotokos” because “the Word was made flesh” in her and through her. In order that the body of Christ might be shown to be a real body, he was born of a woman; but in order that his Godhead might be made clear, he was born of a virgin. It says something about Mary’s role in salvation. Nor was Mary less than was befitting the Mother of Christ. When the apostles fled, she stood before the Cross and with reverent gaze beheld her son’s wounds, for she waited not for her child’s death, but the world’s salvation. Finally, Mary’s divine motherhood says something about the role of the Church. Born of the Father, Christ created his mother; formed as man in his mother, he glorified his Father. 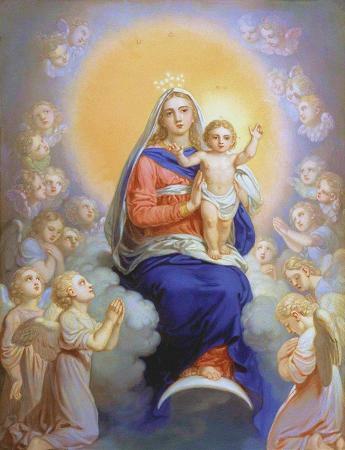 He, the son of Mary and the spouse of holy Church, has made the Church like to his mother, since he made it a mother for us and he kept it a virgin for himself. The Church, like Mary, has inviolate integrity and incorrupt fecundity. What Mary merited physically the Church has guarded spiritually, with the exception that Mary brought forth only one child while the Church has many children destined to be gathered into one body. The greater the love, the greater the sufferings of the soul. The fuller the love, the fuller the knowledge of God. The more ardent the love, the more fervent the prayer. The more perfect the love, the holier the life. The quick hash and the mad dash. And the plane with a brief stop. The brain strain and the heart pain. And the fun is done. We ask your blessing upon your gift of time. Of holidays, holy days, fasts and feasts. The secret that all life is meant for celebrations and contemplation. Bless, Lord, this New Year, each of its 365 days and nights. Bless us with happy seasons and a long life. Grant to us, Lord, the New Year’s gift of a year of love. -- Michael P. Duricy, The Marian Library/International Marian Research Institute. This article was published on Thursday 30 December, 2010. EMMANUEL – GOD IS WITH US! HIS PARENTS FOUND JESUS SITTING IN THE MIDST OF THE TEACHERS. WHETHER THE BLESSED VIRGIN SHOULD BE CALLED THE MOTHER OF GOD?